Early seventies. Leaders of the civil rights movement, such as Kwame Ture (Corey Hawkins), continue to carry their message to young African-Americans. So-called blaxploitation films, with characters like Shaft and Coffy, empowers them at the cinema. The black power shout resounds in representation of the pride of the historically oppressed and violated minority. And in that tenor, the police department of Colorado Springs, Colorado, hires its first black officer, Ron Stallworth (John David Washington). This is part of the context of BlacKkKlansman, the latest joint by Spike Lee, where racial war can certainly explode at any moment, with the intolerance and hatred represented by violent white cops, Ku Klux Klan factions and leaders of this organization, like David Duke (Topher Grace), pointing to political posts. If previously Lee used the setting of the college movie to tackle such issues as apartheid and the rejection of light-skinned blacks within the community itself (School Daze), and a Greek play to send a desperate cry due to the uncontrollable violence in the city of Chicago (Chi-Raq), in BlacKkKlansman he uses elements of the police thriller to tell the incredible true story about how Stallworth led a double infiltration. First is an infiltration into the field of university black activists, for which young radical Patrice Dumas (Laura Harrier) functions as leader, and later to the bowels of a local division of the Ku Klux Klan, helped by the Jewish policeman Flip Zimmerman (Adam Driver). There lies the tension of BlacKkKlansman, with Ron hiding his real identity from Patrice (who hates practically all the policemen, even if they are African-Americans, comparing the latter with the so-called house slaves) and inevitably developing a personal relationship with her; whereas Flip has to overcome tests and constant suspicions, particularly from the ferocious member of the KKK, Felix (Jasper Pääkkönen), as well as acquiring awareness of his Jewish roots as he never had before. Witnessing how a black cop cheated on the phone the white supremacists from the KKK gives way to a hilarious film in which Lee, mainly through the memorable performance by John David Washington, takes the opportunity to mock and even humiliate the racists. 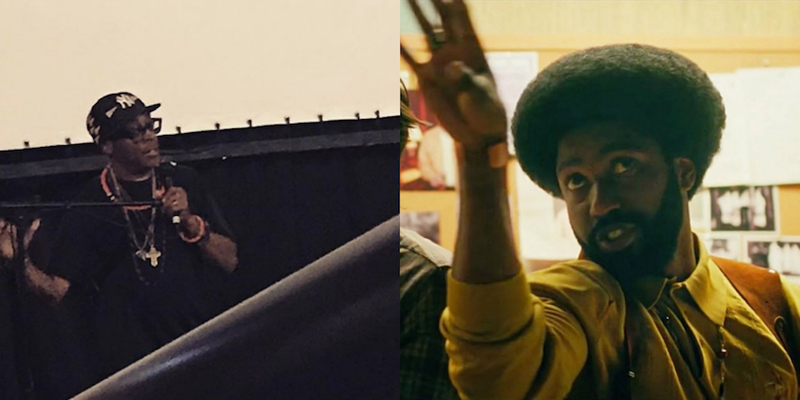 Just like its central character Stallworth, who defines himself as a man who always wanted to be a policeman but not because of that he's unaware of the African-American struggle, BlacKkKlansman is both a comical and entertaining police thriller and an extremely relevant Spike Lee joint. If Do the Right Thing was in 1989 a reaction to the times of Apartheid and police brutality against blacks in the United States, then BlacKkKlansman is Lee's first feature since Donald Trump became the president of his country and, despite being a period piece, serves as a direct response to the rise of the Republican. As the film addresses police abuse, attacks with racist motivations, and a leader (Duke) who advocates racial segregation and to make America "great again", naturally the parallels with today are more than evident. Where Lee finds the greatest tragedy in BlacKkKlansman is that before, the KKK took inspiration to resurface from a movie like D.W. Griffith's The Birth of a Nation. Now, the white supremacists don't have to look for validation in the cinema, nor in one of the KKK leaders, but finally -- and as Duke himself had been looking for -- they can turn to the White House. "This represents a turning point for the people of this country. We are determined to take our country back, we're gonna fulfill the promises of Donald Trump, that's why we believed him and voted for Trump, because he said he's going to take our country back, and that's what we gotta do", said Duke at the fatal 2017 Charlottesville rally. With BlacKkKlansman, Lee demonstrates that post-racial America never existed, that hate triumphed and, consequently, launches an umpteenth call to "wake up." As a side note, Lee visited the Los Cabos International Film Festival to present, among other activities, a special screening of Do the Right Thing. There, the filmmaker loudly questioned the audience about the lack of presence of “black Mexicans” in movies and TV series, therefore applauding Alfonso Cuarón’s decision to cast Yalitza Aparicio, a woman of indigenous origin, as the lead actress in Roma. Lee added that Roma is his second favorite movie of 2018, though his consequent laughter clearly indicated that his top film of the year is no other than his own BlacKkKlansman. You can check out my review of Roma, which was also screened at Los Cabos, here.